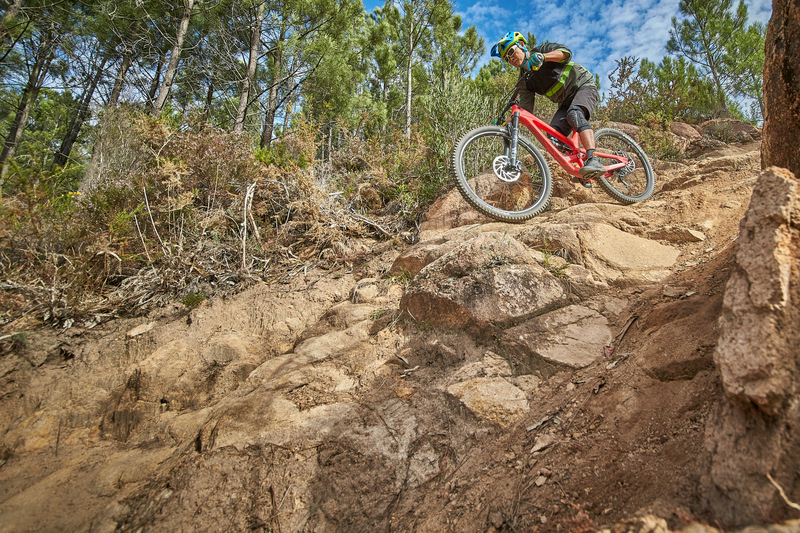 Mtbr flew to Lisbon, Portugal, to learn about the new enduro machine from YT. Editor’s note: This is part 2 of our coverage of the 2018 YT Capra. Part 1 with the details of the bike are covered here. 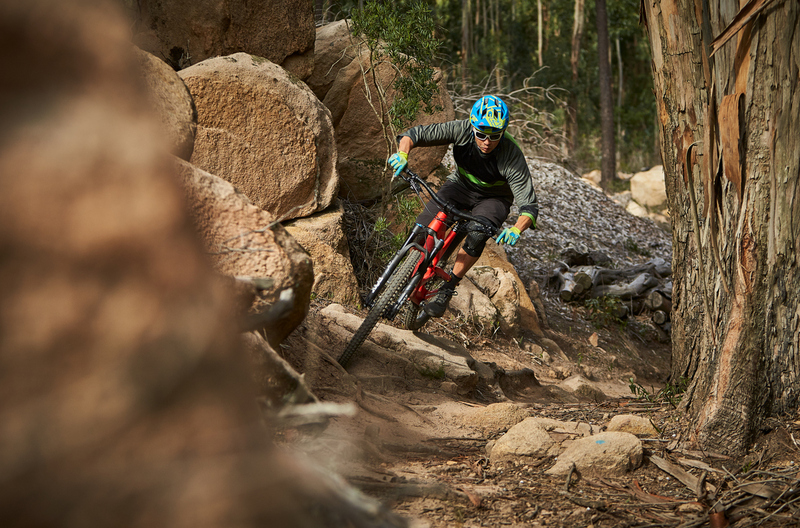 Mtbr rode both 29 and 27.5 wheel size versions of the Capra for a few days during the product introduction. What we discovered was a bike with a big sweet spot. 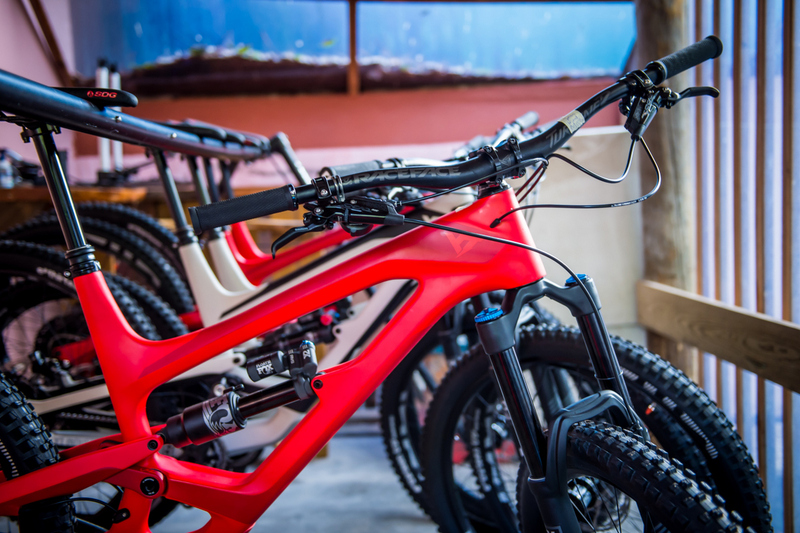 Downhill performance, trail bike climbing, best of breed components, and a dizzying array of options dazzled and confused us. We’ve had a chance to digest it and here’s our attempt to demystify the Goat. The Capra is a bike of significance. YT is a revered brand backed by a good crew of people. We’re reminded of Sugar Ray Leonard delivering a furious combination of compelling blows with every bike detail. And the knockout punch is the pricing. YT Industries was started by Markus Flossman (top). He then recruited suspension guru Stefan Willared (lower left). We got to spend time with the YT crew who flew in from Germany for this launch. At the helm is Markus Flossman, a visionary fulfilling his desire to offer good bikes at a lower price. He started the company by piecing together a BMX bike with the best components he could find at a price point. But instead of $1000, he put it on the market for around $500. It reviewed well and the first run sold out. His secret weapon was industry knowledge, manufacturer relationships, and the consumer-direct model. As he entered the realm of suspension bikes, he understood his limits well enough to recruit the smartest engineer he knew, Stefan Willared. 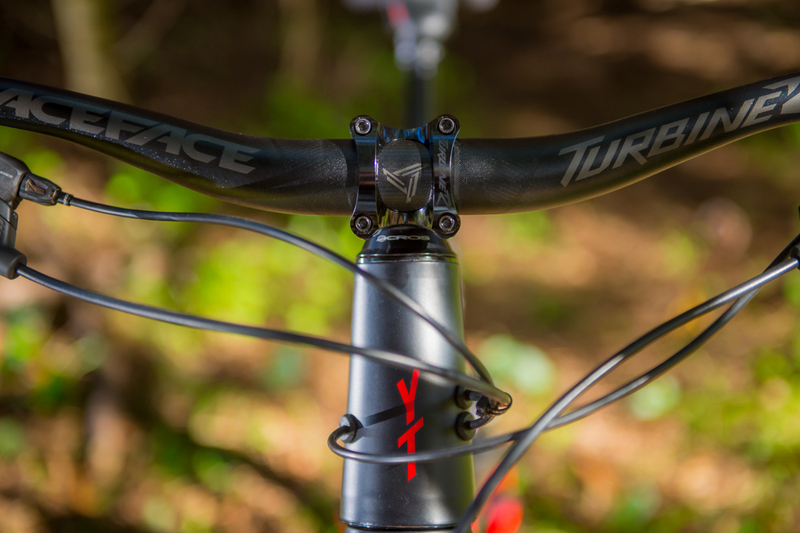 From there, YT set on its course to offer the fun, aggressive, full-suspension bikes. Many of the crew we met were completely focused, motivated, and new to the team. They are growing by leaps and bounds in a slowing category, as they keep making all the right, key moves. Part of the process is the transition to a new facility in San Clemente, CA, described here. It’s about process and control, as they use their own employees and funds to man U.S. operations and better manage and forecast inventory. And in line with their core values, they are eliminating a distributor layer to deliver better pricing to the consumer. No, it’s not a fleet of new models, it’s one bike available in about 10 permutations. 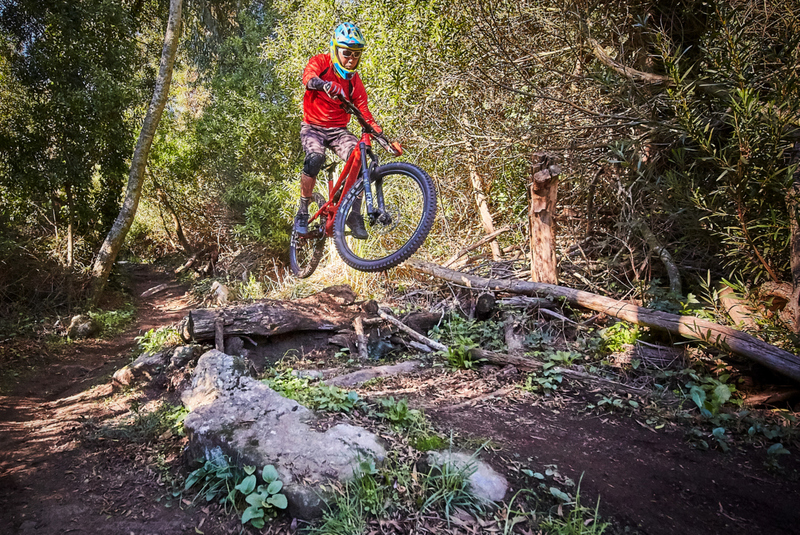 YT Industries is a consumer direct brand, but unlike many in the category, they sought to be a premier brand, not a discount seller. That means that from inception, branding, art, athletes, and advertising have been key initiatives. They explained to me the logic behind the fourth iteration of their logo and I was a wee bit baffled by the effort. But as I listed to Markus describe the curve, the scale, and the motion of the logo, I learned to appreciate that these are passionate people taking a holistic approach to their branding efforts. 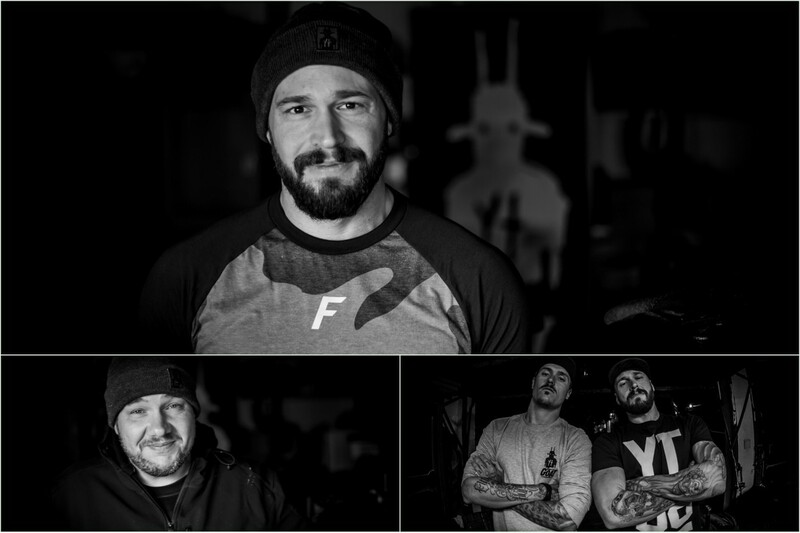 Such efforts have been rewarded with top athletes joining the crew and customers who would sport the brand above all others. Riding from the top of a Sintra hill to the ocean. 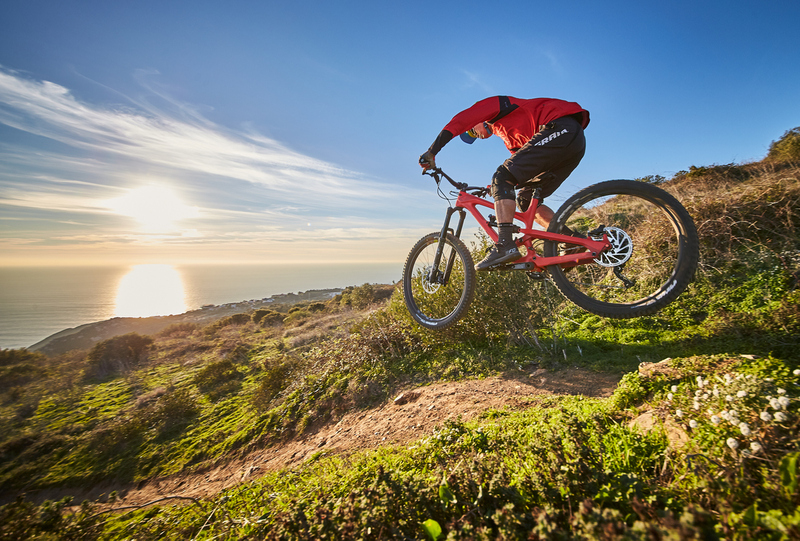 The Capra is an all-mountain bike available in 29er or 27.5 wheel sizes. 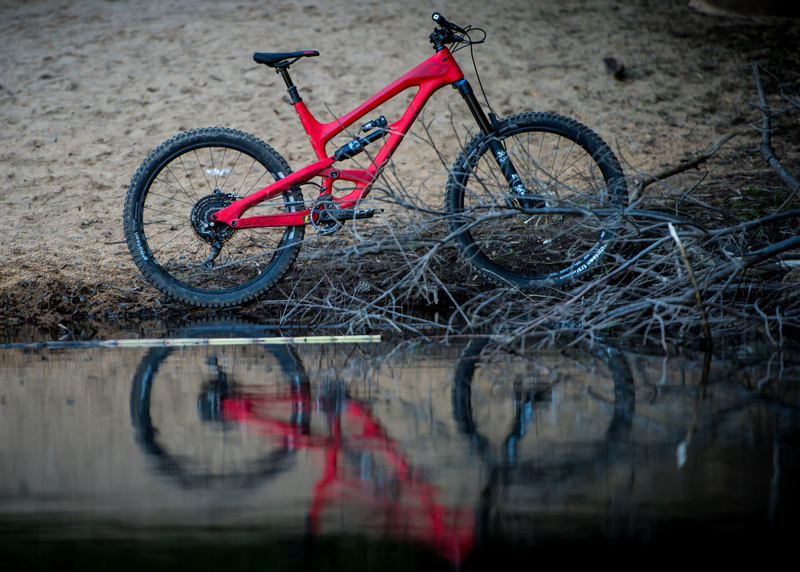 It sports 160mm front and rear travel in 29er form, and 170mm in 27.5. If that wasn’t rowdy or competitive enough, there is Race version with longer shaft lengths that increase the travel to 170mm in 29er and 180mm for 27.5. Everything is explained in more detail here. It is a bike centered around aggressive, all-mountain riding and its enduro racing competitive outlet. 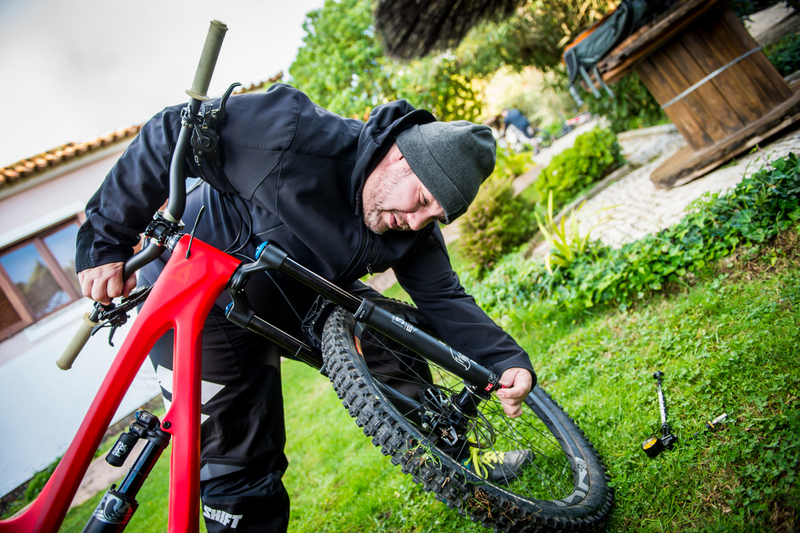 It can be used in a bike park or the occasional DH race fitted with a dual-crown fork. Or one can put lighter wheels and tires and ride a 30-mile epic. The bike allows one to explore the edges of one’s comfort zone. We’ll cut to the chase and answer the question, How does it ride? The answer is it descends like a downhill bike. Suspension travel is ample, active, and well damped through its travel. It’s air sprung, but very plush with the metric shocks used with low leverage ratios. It is confidence inspiring as one enters rock gardens or steep chutes. Pivot one’s balance point on the pedals and the bike seems to do the rest. Travel is well-supported, so although active, it doesn’t dive on transitions and upset the balance of motion. Case a landing? It’s ok as the bike offers a safety buffer when one runs out of talent. 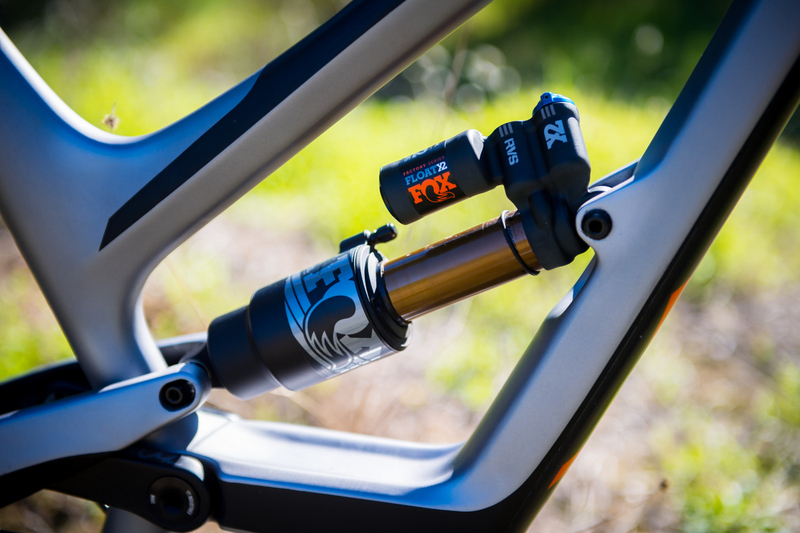 We love the Fox DPX2 rear shock for its overall performance but the Fox X2 really shines on the Capra. It is such a quiet, confident performer, keeping everything calm. Lateral stiffness is very good so it keeps a line through ruts and rocks with ease. 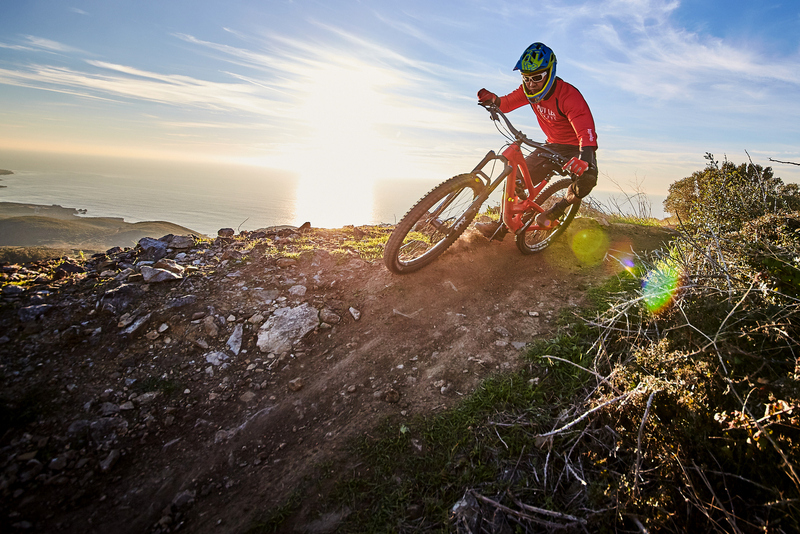 The Capra keeps its line, especially in the 29er guise so one has to be deliberate to change directions. 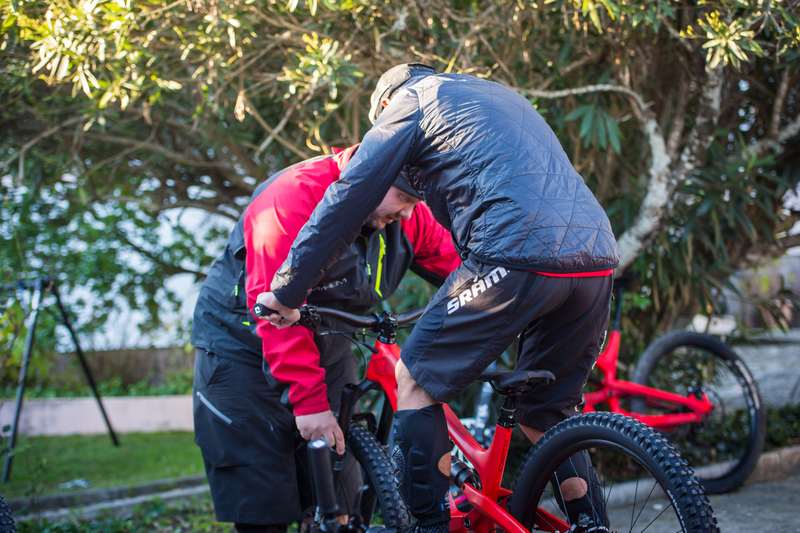 We noticed that the 27.5 offers a plusher ride than the 29er. 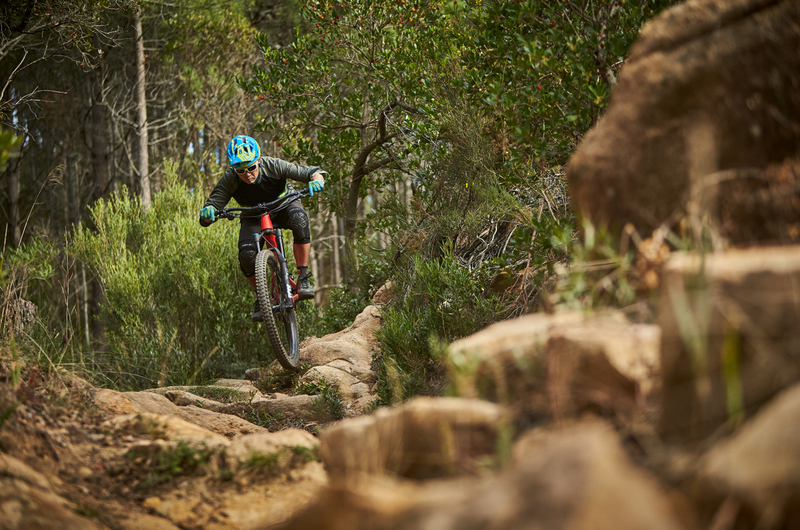 Aside from 10mm less travel on the 29er, the rear shock tune is a little more firm, making the assumption that the 29er will be used for more epic climbs. Cornering and changing directions with the Capra is best done deliberately. 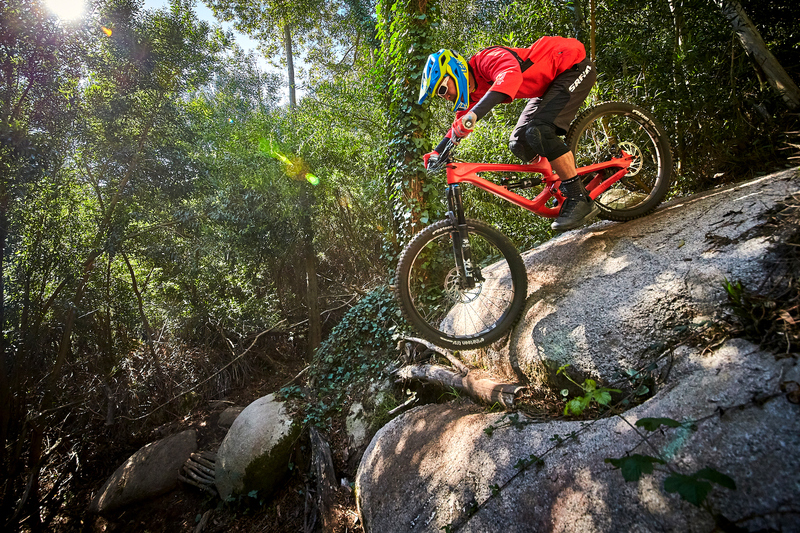 We benefited from the use of e.thirteen’s incredibly capable tire reviewed here. Thus, we had a cornering advantage in the mixed terrain of the Sintra trails. As we mentioned, lateral stiffness is impressive, so this bike holds a line until instructed to do otherwise. BB height is nice and low at 345mm with this amount of travel. This bike changes direction well with good traction. One just has to be deliberate about it. With a 65-degree head angle, one can’t sit back and steer, especially on the 29er. One needs to move the body forward, lean, and boogie. With very short seat tubes, the Capra allows the rider to choose among two or three frame sizes, optimizing reach and wheelbase, not just seat tube height. We love this concept and it affects cornering the most. Opt for a smaller size and the bike changes direction easier. Opt for a bigger frame size (or bigger wheel size) and the bike will hold a line at speed, but it will be harder to change direction. This is appropriate use of the Fox X2 shock. Climbing seemed good, although we did not have enough time in this arena. The 75- and 76-degree seat angles put you in a good uphill pedaling position. The Fox DPX2 rear shock version controls the climbing very well. 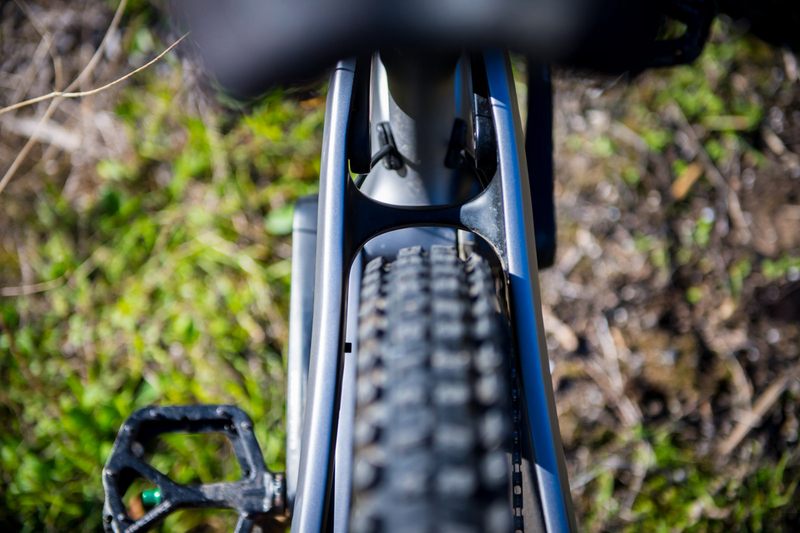 This is our favorite sweet-spot rear shock, since it allows the rider to climb and descend in trail mode all day. This complements the climbing abilities of the bike and delivers traction while pedaling up rocks and roots. And most notable, is it seems to climb better than any 4-bar bike we’ve tried. They’re both 4-bar suspension, but the YT Capra puts a bar/link (where the water bottle normally is) to arc the suspension movement and pre-load or control the suspension for pedaling. Let’s not forget, though, that I had e.thirteen TRS knobby tires front and rear, so these were not fast rollers. We feel though that the rear or front can be optimized if one was going to do a lot of climbing. Climbing switchbacks and very tight singletrack is not as good with that 65-degree head angle and longer wheelbase on some sizing options. A good descending bike instills confidence and encourages playfulness. Mirror, mirror, who has the highest travel of them all? Travel is sometimes viewed as a race for top mm or a race to the bottom. The dark side of this kind of bike is someone from Florida or Dallas will buy it and expect it to work out. It’s not ideal for many applications. But if one has mountains, rocks, roots, and a desire to travel the land and improve one’s riding, this can fit the mold. It’s under 30 pounds in top spec and it pedals well so it can climb. The only real issue is can one find the terrain and the skillset to explore the descending range of the bike. Many are curious and we think many will be happy with this bike. Some are adamant against getting too much bike. We believe the contrary, and think riders who want to progress should get 25% more bike. That headroom will allow one to progress and learn safely. And if one goes on a road trip to explore new terrain, the extra travel will allow one to be in the comfort zone. Also, riders don’t always have their best day. Sometimes, every rock and rut hurts. And we humans make mistakes. We want a bike to have our back in those moments. For a lot of folks who want to get rad and progress, it’s good to get more bike than you need. They are aspirational after all. And when you go to Moab, the Sierras, and Canada, you have a bike that has gobs of travel and will perform well on your adventures. When you run out of talent or have a bad day, it’s good to have a bike that will save you. There is no suspension adjustment like a Stefan Willared YT tune. Geometry bridges the gap between the European movement and U.S. traditionalists. The 65-degree head angle and 75-degree seat angle are aggressive, indeed. 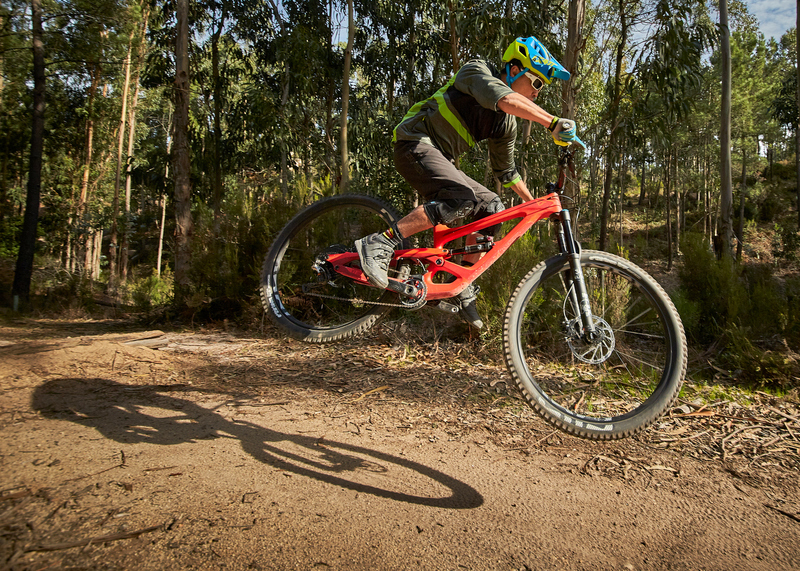 The 29er even supports a 76-degree seat angle and has a flip chip to tune the geometry. Everything checks in with a 345mm BB height that’s low enough for this amount of travel. Chainstays are at 435mm for the 29er with big tires and 170mm of travel. And increasing the chainstay to 440mm for larger sizes to improve center balance is very thoughtful. There are five sizes available and the seat tubes are slammed low to get out of the way. Increments between sizes are small so the rider can choose between sizes to optimize for reach and wheelbase. A crater in its wake. No doubt about it, the lack of any water bottle carrying capacity will disappoint some prospective buyers. Why then did YT do this? The reason is they sacrificed the water bottle to avoid compromising the frame. The suspension kinematics have free reign to control the 4-link movement with that bar that crosses the rear triangle area. Also, they’re able to slam the seat tube and top tube very low to lower the center of gravity and allow the longest dropper posts for a given rider size. The issue is a growing contingent of riders simply don’t want to ride with a hydration pack anymore. It upsets the center of gravity and ventilation of the back. Luckily, there is a growing armada of hip packs. Hip packs for hydration and tool carrying capacity is a growing category. We almost feel compelled to review a line of hip packs that go well with the Capra. Aside from the lack of water bottle, the only other controversial choice on the Capra launch is the decision to go with an e.thirteen cassette and not a SRAM Eagle offering. Riders are enamored with the performance and options now available with Eagle 1×12, so some will be disappointed by the 1×11 e.thirteen spec. 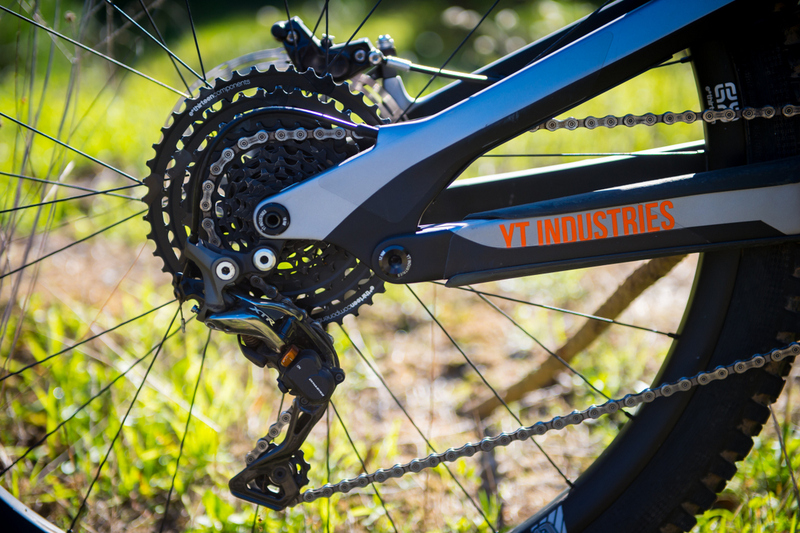 But YT says this 11-speed cassette has a 511% gear range and many perceive it as 11% more than Eagle’s 500% range. The math though calculates to a 2.2% difference so they’re virtually equally. In actual use, however, most of the range gained by the e.thirteen cassette is from the 9-tooth cog. That is not very useful since it seems to introduce a lot of drag to the drivetrain with the chain links too large to wrap around such a small cog. Also, we’ve used this cassette a lot and brand new, it is more clunky than a Shimano or Eagle cassette. After six months of use, it displays notable wear on the big three alloy cogs. But it’s easily replaceable with a Shimano cassette, and there’s hope that there will be more 11-speed cassette options in the future. The e.thirteen rear tires on the other hand are one of the best in this category so we have no issue with them. In the future, it would be good to have a faster rear tire option to complement the large sweet spot of the bike, though. 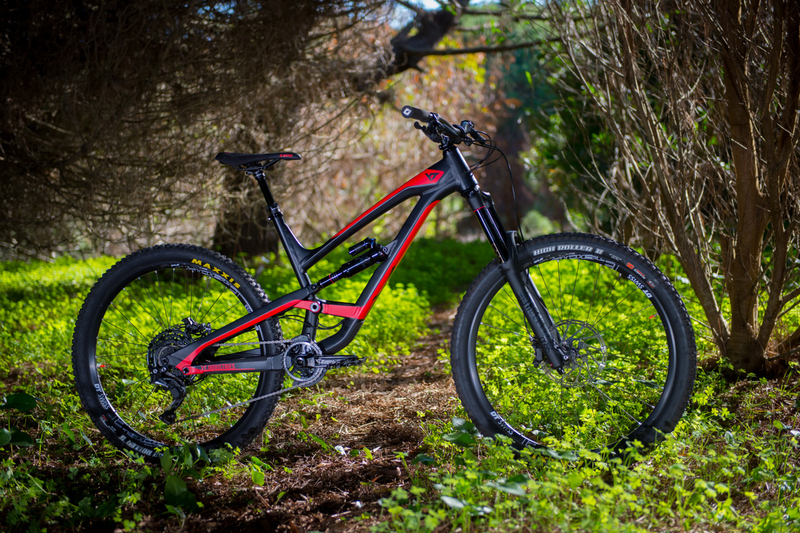 If the top-spec’d Capra was priced at $10,400, we believe they’d still sell. It is a bike of significance from a brand that is respected. But at $5200 for the top spec (available in two wheel sizes) they’ll sell a ton. And at $2500 for a well-heeled starter Capra, they’ll sell even more. This is part 2 of our coverage of the 2018 YT Capra. The details on the bike are covered here. 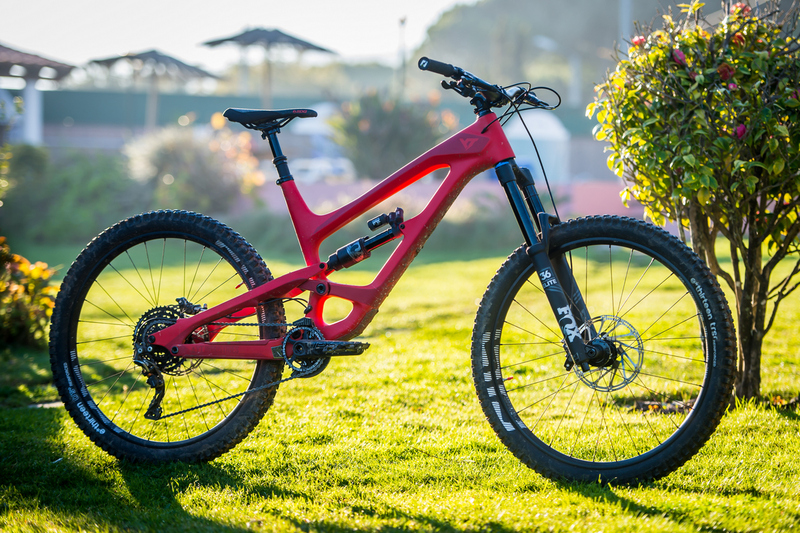 Mtbr flew to Lisbon, Portugal to learn about the new machine from YT. 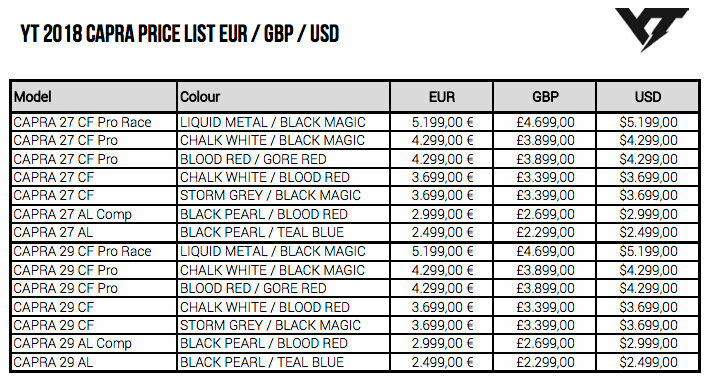 The entry price for this dream bike is attractive at $2400. Cable routing on the Capra minimizes rubbing and rattling. Tire clearance on the 29er CF with the E-Thirteen tire. Descending down to the ocean is a dream easily fulfilled in Portugal. A good descending bike instills confidence and encourages play. The terrain in Sintra, Portugal always involves rocks of many sizes. The bike allows one to explore the edges of ones comfort zone. The guides at We.Ride gave us plenty of warning about this segment but it was fairly uneventful with the Capra 27.5. The 27.5 Capra is an absolute delight in the air. 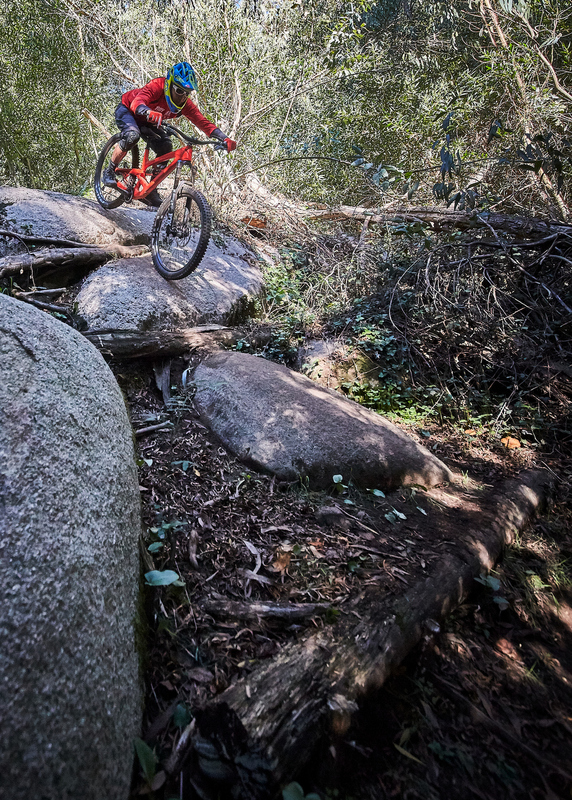 The trails in Sintra, Portugal seem purpose-built for riding. Stefan Willared can design and setup up suspension like no other. 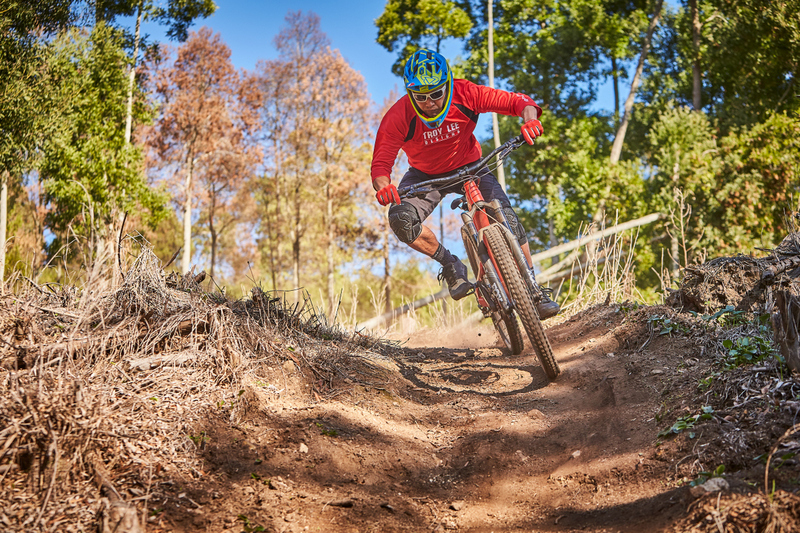 YT Industries was started by Markus Flossman. He then recruited suspension guru Stefan Willared. I don’t agree on the E13 cassette. I have now been on the E13 cassette for two years now, on two bikes, and it is, by far, a superior option. It weighs less, and no, the 9 tooth cog does Not bind the chain even remotely so. As far as wear : my E13 cassette is the very first cassette that has actually lasted more than a single season of hard, daily usage…I have yet to replace either of my cassettes. This makes me wonder IF such jabs are done on purpose to steer people away from certain products because they are a threat to the SRAM etc. Such comments are bogus, so whoever is may be considering what cassette to go with, I can speak from first hand, long term-experience : the E13 cassette’s and range are all you will ever need, are lighter, and hold up. Appreciate all your first-hand experience very much! I really want to like these bikes. In fact I do (on paper) but at my body weight of 240 lbs four bar suspension was always too active and required high shock pressures. >>I really want to like these bikes. This is worth a look p brig. They control the 4-bar linkage with that middle lever that arcs the suspension to give it a pedaling platform. And these big metric rear shocks in DPX2 or X2 form will give you enough damping options to control the suspension movement. No guarantee but worth a look. Also, the lateral stiffness should be enough for your weight too. That was a short but interesting brief there on the climbing abilities that did not really distinguish about any differences between the different builds. For example, DPX2 was said to be great for climbing. So, I guess then that the Capra 29 CF Pro is it then, as it is the only build with that shock! What about the climbing of the Capra 29 CF Pro Race though? I can only guess that the harder-to-set-up X2 and, the higher front, giving a more set-back saddle position with 75° instead of 76° seat tube angle, impairs climbing for the mass. And then again, does this mean that the 29 CF Pro Race is less for technical climbs but more for easy fire-roads up but then of course the most secure bomber going downhill of them all? This is my guess, reading about the bikes, shocks, etc. Please help me! Am I right or wrong ? ?